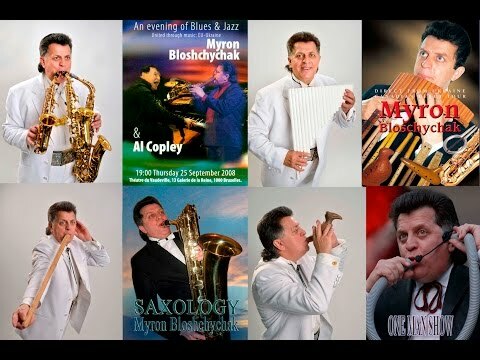 Myron Bloshchychak is an accomplished musician from Lviv (Ukraine) who collects Ukrainian folk instruments and creates the instruments he plays. Both his music and his instruments are of superior quality. The spectrum of music he plays is amazingly wide-from classical to folk. Myron Bloshchychak went from village to village in the Carpathians, gathering information about ancient instruments, watching these instruments being made and played. That was the way he himself learnt how to make and play them. The range of ancient folk instruments he can play is impressiv indeed: Telenka, Rebro, Flojara, Zozulia, Sopilka, Dvodencivka, Drymba, Will Lira, Mundharmonika, Ocarina, Accordion, Trembita, Koza, to mention just a few. Sometimes he makes instruments of his own design that have never existed before, using all kinds of materials for them. His recent invention is a «Windphone» which makes musical sounds when it is exposed to the wind. 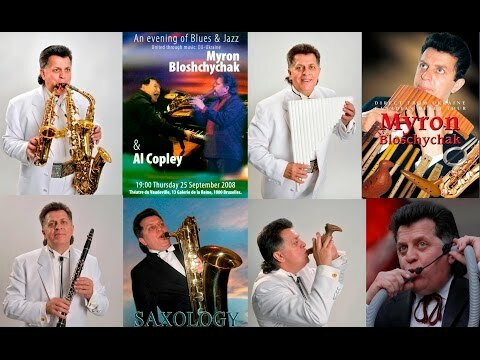 Myron Bloshchychak was educated at a musical school and conservatory, majoring in the clarinet. Among the modern instruments, he plays the saxophone and clarinet excellently, but ancient and folk instruments are closest to his heart. There is hardly anything that he cannot use for playing music – a length of garden hose a glass with Vodka or a bottle filled with water would do – and his concerts are impressive shows of his talent and his skills. No matter what he plays there will not be a single false note. Myron has performed in many European countries including Denmark, Holland, Norway, France, Germany, Italy, Spain, Belgium as well as the USA and Canada.